Update 4/09/15: As of today, the new Contacts Preview sort y last name is actually displaying last name first. As you may have guessed this was a big ongoing complaint of users after the sort functionality came out. Note, although displaying last name, first name in the Frequently Contacted section, this section is still sorted by contact frequency and not by the sort selection chosen. 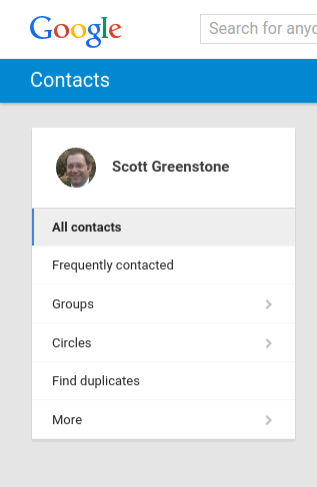 Update 3/24/15: As of yesterday a new sorting feature has been added to the new Contacts Preview. You can now sort by First or Last Name. Seems more and more Google is listening to user requests. Recently, Google has started offering a new Contacts Preview page, with lots of feature changed, but with a beautiful Material Design UI. One common complaint I have started to notice on the forums and social media is the lack of changing the sort option. 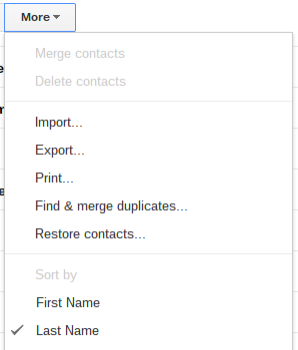 In classic Contacts you have the option to sort by first or last name under the More Menu. This option is glaringly absent in the new contacts preview, which defaults to sorting by first name. However in there is a field included in both classic and new contact preview that can be added to a contact card that will change how it is sorted. This is not a great workaround for resorting your entire contact list, but it can help you place certain items towards the top of your list for example. In classic contacts the field is called File As, in the new Contacts Preview the field is called "add a name used for sorting". This field is not visible when you first enter a contact card, so you need to show all fields to see it. Just open the contact card, click the pencil to the top right to edit, scroll to the bottom and click on Show All Fields. Now you will see the "add a name used for sorting" field. Type the name you wish to sort by and click save. If you look at the image below, I have three Test Contacts sorted alphabetically by first name. You will see the first test contact with an profile image moves to the second in the list after changing the add a name used for sorting field. As I mentioned, this is not a great workaround for every single contact in your list, but can work if you just need to resort some contacts. Thanks so much. Nice blog yourself. Scott, I want to export Contacts and import into a database where I can change the contents of the fields Name and "Add a name used for sorting", and then reimport. However, exporting to csv (Google or Outlook), I cannot see the field "Add a name used for sorting" at all. Do you know how come? That is becuase the Add Name Used for Sorting field is a field in classic contacts, only in the new Contacts Preview. The export functionality is actually part of the classic Contacts. Scott, thanks. However, I unfortunately do not understand what you mean by your first sentence. I guess, having read your sentence a few more times, that you meant "That is becuase the Add Name Used for Sorting field is NOT a field in classic contacts, ..." Correct? Scott, would you have a feel for when either this field would be entered into classic contacts OR (more likely, I guess) we can export from Contacts Preview? I do not - I have escalated this as an issue though. Marlene, many of Google products do not have sorting capabilities. This is because it is expected that users employ the powerful search tools that are included. It is much easier to search for the company name than it is to sort by company name and then scroll through to get to that company in the list. What a pisspoor answer. According to this logic, we shouldn't be sorting things at all. Ever. Just throw everything out in the grabbag and search for it. Let anarchy rule. What is REALLY needed is allowing for multi-tiered sorts. Ie. Sort first by company, then by last name. (or whatever parameters you desire, allowing sorts on ALL of the fields). I agree with Marlene: I am using Google mail for my small business and it drives me crazy that I cannot sort by company. I import to Outlook where I can do this, but that doesn't help me on my phone. I'm trying to set my dad up on Gmail, it's mostly going ok, just a couple of issues left for how he wants to do things. He likes viewing his contacts by last name only, which working now. However when you come to "select contacts" via compose message these are sorted by first name with no option to change that. Is there a workaround for this? No in the compose it is not sorted by last name and that is not possble. Sorry. Hi Scott. I landed here while looking for information on to how to get the dreadful contacts preview to correctly differentiate between name(s) and surname(s). There appears to be a single field name, and sorting results in my contact list vary depending on who knows what. Any suggestion? Sorting through that A/Z icon works fine. The problem is that, in some instances, the contents of the Name field are not recognized. For example, "John Richard Doe" may appear listed as "Doe, John Richard" (correct) or "Richard Doe, John" (wrong). If I remember correctly, the old version allowed a clear definition of name and surname, which is what goes wrong now and I can't find how to fix. I have not experienced that. If you see it again, feel free to use the contact me link in the menu at the top to send me images. Thanks for offering, Scott. I'll do it if the pain level increases. Right now, it's just a mild inconvenience, since most of my contacts were already in place before the new and "improved" system was implemented. My "contact" lists my contacts my last name, the way I want it. However, when I use Gmail and I hit "to" or "bcc" the list comes up first name, first. I cannot find a "A/Z" to hit, like there is on the Google Contact List. How to I change the present format, so that I see "last name first"
You cannot. In gmail it first puts frequently contacted matches first. Hi Folks - just making migration from MS world and Outlook to Goggle Docs and Contacts etc. (new job) and have the same issues listed above - one possible work around might be to search for company within your large number of contacts in My Contacts (e.g. IBM); then open and select all and then create a new group under the Groups Tab (BT) - key point is this is only a label and can be easily removed without effecting the contact - hit 'Apply' and all these contacts will now be labelled "BT" - and will appear when you hit this Group.You can do this as well when you add a new contact/ new company - and this list will be updated and available each time you use the Groups Tab - I think this should work and help. I am currently trying to build a shared 'customer contact' list and will be importing several lists tomorrow - and would like to be able to have one shared and consistent view all sales team can use and add to - but its not easy ! Hi, I'm trying to sort my contacts by first name. I know about the A-Z, first name and last name, however when I select first name all my contacts are in random order. I have refreshed the screen after clicking on first name. Any other suggestions? 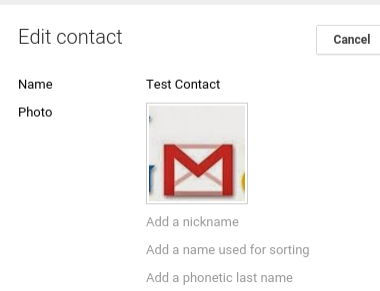 So from all the responses, I 'presume' there is still no way to simply display the Company Name in the Google Contacts preview pane? Anyone we can contact at Google to ask why not? WE HAVE MORE THE 345 EMPLOYES AT OUR FACILITY, AND YES GOOGLE CONTACT IS USEFUL TO DOWNLOAD TO YOUR PHONE IF YOU LOOSE IT. BUT TO SORT BY NAME AND LAST NAME. WHAT A JOKE!!! NOT USEFUL AT ALL FOR COMPANY. HOW CAN YOU REMEMBER THAT JOE SMITH IS ABC COMPANY. ALL YOU NEED TO ADD A SINGLE FONCTION: COMPANY AND MAYBE GROUP LIKE IN OUR ANDROID PHONE. It seems clicking at the top of a column header to SORT the contacts in a given view by that header would be pretty simple solution. Could sort your contact list then by company, area code, city, state, zip code, country. I am trying to find all contacts in a category in a specific city. The category has 250 contacts. How to quickly find all of these companies located in that city?